But... if a damn spider the size of this thing came at me... well... that would change my opinion entirely. 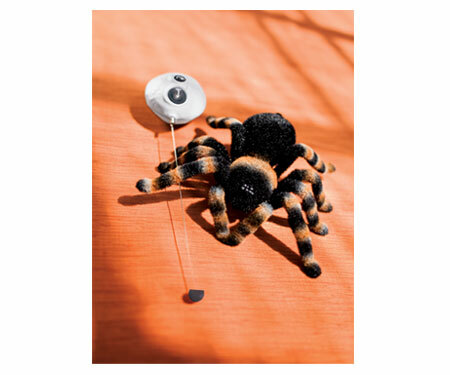 The remote controlled tarantula is just plain creepy. It weighs in at one pound and measures just over six inches in length. Its body is furry, its eyes light up, and it crawls across the floor like a real spider. Its about the size of a small dog-you know the kind that shake and pee all the time, but have that crazy look in their eyes that tells you not to pet them. And all of that scariness is powered by two AA batteries-though it apparently chews through batteries quite rapidly, so rechargables would probably be a good choice. Though the legs move, it actually maneuvers on wheels located beneath its abdomen. Unfortunately, this hinders movement over carpet, so it's best to keep the tarantula on a hard surface. Also, the legs are quite delicate (not unlike a real spider), so it should be handled with care. However, if you have the questionable notion of freaking out your girlfriend (which is my intention-I'll probably get bludgeoned horribly, but it may be worth it), this is the toy for you. Plus, if she goes ballistic and smashes it, you'll just have to clean up electronic parts instead of that nasty goo that real spiders have in them... blech. UPDATE: This radio controlled taratula is no longer available. 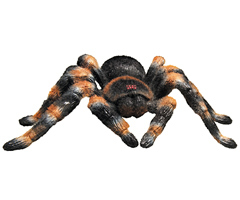 A good alternative tarantulas are available here.